Star dress julian macdonald size 16. Condition is used but very few times. The pattern is very bright and bold. he dress is lined. Ask any questions, will only post in UK. Please pay within 48 hours.Dispatched with Royal Mail 2nd Class. Beautiful Star By Julien Macdonald tunic dress for sale! Gorgeous black design on beige background. Very flattering, great with or without black leggings/tights. Grab a bargain, starting price only £7.00! Star By Julian McDonald Size 8 Black Dress with Orange Hem - Worn Once/As New. Dispatched with Royal Mail 2nd Class. This huggy fitting dress is size 10 & it looks really good on It has been worn and is in very good condition Please message me if you have any questions Take a look at my other items if you have time Thanks for looking. Here I have a Julien Macdonald, Star pencil dress. Mustard yellow colour, with multi colour floral and jewel pattern. Sweetheart neckline. Fitted bust, fits into the waist, then pencil fit to the hem. Condition is Used and in excellent condition, worn once. A very comfortable dress that is stretchy so nice to sit down in without tightness round the belly. A truly gorgeous stretch silky jersey 3/4 sleeve dress in a beautiful ivory & black print from the STAR by JULIEN MACDONALD Designers @ Debenhams range which is in excellent lightly used condition. has 3/4 length sleeves, a V neckline with flattering centre front gathered detailing & fall. 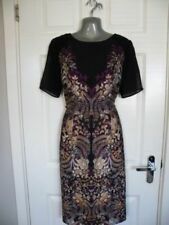 LADIES JULIEN MACDONALD stunning short sleeve dress size 14. All item I list are genuine. A truly stunning stretch bodycon pencil dress in black with a contrast floral print on a black background from the STAR by JULIEN MACDONALD Designers @ Debenhams range which is in immaculate WORN ONCE condition. Star By Julien MacDonald Black Shift Dress. Size 8. Hip across 22". waist across 18". shoulder to hem 40". armpit to armpit across 20". STAR BY JULIEN MAC DONALD ALL BUTTONED BELTED A LINE DRESS. 55% LINEN MATERIAL. It features a scoop neckline and has a zip fastening. It is made from a black coloured material and would be ideal for different occasions. Main Colour: Black. Gender: Ladies. Style: Wiggle, Pencil. Beautiful Star By Julien Macdonald tunic dress for sale! Gorgeous abstract floral striped black and beige design on front and back. Very flattering, great with or without black leggings/tights. Grab a bargain, starting price only £7.00! This lovely STAR by JULIEN MACDONALD multicoloured Aztec patterned short dress is a UK size 12 and BNWT. This could also be worn as a long top over jeggings. This can be affected by different light conditions or your screen settings, depending on your local screen settings photos might appear differently as brightness and colour settings can affect their look. 40% Off . 20% Off . 50% Off . 30% Off . Wholesale Lots. "STAR BY JULIEN MACDONALD" 14 COTTON LINED ANIMAL PRINT DRESS G.C. Condition is Used. SMART DRESS BY "STAR BY JULIEN MACDONALD" @ DEBENHAMS 95% COTTON 5% ELASTANE FABRIC, WHITE BACKGROUND WITH BROWN AND BLACK "ANIMAL PRINT" WITH SOLID BLACK AND RED BANDS AT THE HEM, FULLY LINED IN BLACK POLYESTER. 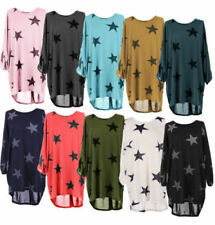 Beautiful Star By Julien Macdonald tunic dress for sale! Size 16 but also suitable for 14. Gorgeous black and white design with beaded neckline. Very flattering, great with or without black leggings/tights. Pretty lace tunic, lined body, but not the arms, Zip up back of dress. back length 30.25". armpit to armpit 19.5". Star Julien Macdonald 12. Condition is Used. STAR BY JULIEN MAC DONALD STRETCH BANDAGE BELTED BODYCON DRESS. FLORAL RUFFLE ONE SHOULDER. SIZE 12 UK. JULIEN MCDONALD (STAR) ANIMAL PRINT MINI TUNIC DRESS UK-14 BUST38" LENGTH 33"
JULIEN MACDONALD TUNIC MINI DRESS UK-14 IN BROWN/BLACK/BEIGE MIX. UNLINED, PERFECT FOR ANY OCCASION. SHOULDER TO HEM 33". LENGTH OF THE DRESS 87 CM (FROM SHOULDER TO THE HEM). JULIEN MACDONALD. Halter Neck Dress. Black Ivory Brown. Feels like silk. Machine Washable. BY JULIEN MACDONALD. BEAUTIFUL FLORAL PRINTED SHORT SLEEVED DRESS. THIS IS A BEAUTIFUL SHORT SLEEVED, ROUND NECKED DRESS. LENGTH - 40". BUST - 40". SADLY IT'S NOT MY SIZE! Julien Macdonald. Ruffled detail to the chest with a mock belt to the waist. Gorgeous calf length dress in a black stretchy fabric. Waist: 29". Underarm to underarm: 17" (laid flat across the chest). This pretty dress is a soft and floaty fabric. Keyhole fastening at the nape of the neck. Fabric: 100% viscose. Zip Up Denim Dress from Star by Julien Macdonald. Worn once or twice but in excellent condition. Selling as it no longer fits me. Lovely dress from JULIEN MACDONALD's STAR range. Wrap dress. Cross over wrap style, ties on the inside on one side, and the outside on the other, at waist level. Frill trim at front neckline, that then continues down to the hem. 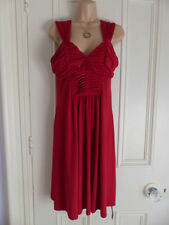 STAR by Julien MacDonald dress, size 12. Gorgeous orange, white and black chevron-style pattern with embellished v-neck. Julian Macdonald. Lovely brown tunic top. Size 10 very stretchy.